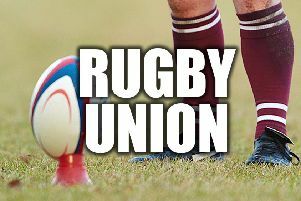 Buxton RUFC v Sleaford RUFC, Buxton, United Kingdom, 16th September 2018. Photo by Glenn Ashley. The performance was witnessed by a record home league gate for the Stags, with an attendance of 110 spectators initially, swelling to around 150 with the juniors arriving during the game, in readiness for their game against Sheffield later in the day. The Stags platform was set by a truly dominant forward display with lock forward Dan Hay driven over from a maul on three minutes for a 5-0 lead. The second try followed shortly after with the Stags producing a devastating driven scum from 10 metres out, which saw number eight Kieran Win dive over at the base. 10-0 with both conversions unsuccessful after 10 minutes. Centre Ben Austin was next on the score sheet, shrugging off multiple tackles to score under the posts, this time with a conversion by Josh Rees for a half time lead of 17-0. The second half saw a deterioration in the weather and with that a period of static play due to repeated handling errors from both sides leading to a period of parity in midfield. The Stags’ defence was tested repeatedly but held firm. A dubious decision saw a deliberate knock down five metres out go unpunished and the Stags failed to capitalise on both scrum and lineout close in, until the deadlock was finally broken in the half by captain Josh Degroot. He threw an outrageous long pass to Steven Jackson, who scored in the far corner to extend the lead to 22-0 and secure the four-try bonus point. With the win now secured and only 10 minutes left the Stags were pushing hard for further broken filed opportunities, Degroot produced another lengthy pass to Kyle Mellor on the wing who showed all the skills of the other code, deftly kicking the ball through for full back Ed Oldridge to score his first try for the club on debut. It wasn’t a day for conversions with a fourth miss. A late consolation try converted by Sleaford right on the whistle ended the game with a 27-7 win for the Stags. 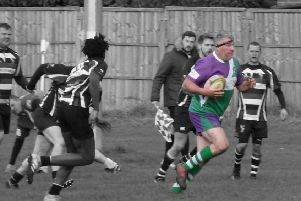 Director of rugby Karl Degroot said: “It was fantastic to see so many people out watching the game, especially given the weather conditions on the day. A real testament to the decision making process to go for the move. Buxton are at Ashfield this weekend in the first round of the NLD Cup.